Some 844 million people worldwide have no access to clean, safe water – meaning one in every nine people (water.org figures). Yet about 13,000 cubic kilometers (3,100 cubic miles) of fresh, clean water in the atmosphere are just waiting to be used. That is more than what is in all the rivers and freshwater reservoirs on the planet. 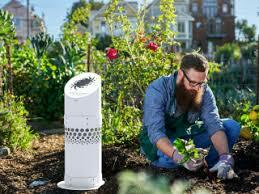 “WaterSeer takes the moisture laden air and extracts the water for use. WaterSeer is a green, low maintenance, and mobile water solution for any individual or community. It provides an endless supply of pure water for drinking, agriculture and nature,” says the WaterSeer website. It uses the natural cooling of the ground to bring the ambient air close to the condensation point, then moves this air into an active cooling condensation chamber. The water collected in the WaterSeer is ready for use or transfer to a larger storage reservoir. The water is clean, fresh, cool and free of pollutants, particulates and contaminants. It exceeds the US Environmental Protection Agency standards for water purity and is cleaner than tap water. Water Seer Inc. has been named a Women Startup Challenge: Emerging Tech finalist. The challenge is co-hosted by Google.